In cell biology, the cytoplasm is the material within a leevin cell, excludin the cell nucleus. 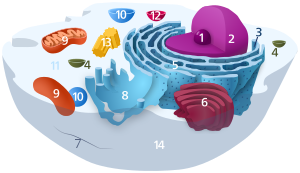 It compreeses cytosol (the gel-lik substance enclosed within the cell membrane) an the organelles – the cell's internal sub-structures. Aw o the contents o the cells o prokaryotic organisms (sic as bacteria, that lack a cell nucleus) are conteened within the cytoplasm. Within the cells o eukaryotic organisms the contents o the cell nucleus are separatit frae the cytoplasm, an are then cried the nucleoplasm. The cytoplasm is aboot 80% watter an uisually colourless. The submicroscopic grund cell substance or cytoplasmatic matrix that remeens efter exclusion the cell organelles an pairticles is grundplasm. It is the hyaloplasm o licht microscopy, an heich complex, polyphasic seestem in that aw o resolvable cytoplasmic elements o are suspendit, includin the lairger organelles sic as the ribosomes, mitochondria, the plant plastids, lipid droplets, an vacuoles. It is within the cytoplasm that maist cellular activities occur, sic as mony metabolic pathways includin glycolysis, an processes sic as cell diveesion. The concentratit inner aurie is cried the endoplasm an the ooter layer is cried the cell cortex or the ectoplasm. Muivement o calcium ions in an oot o the cytoplasm is a seegnalin activity for metabolic processes. In plants, muivement o the cytoplasm aroond vacuoles is kent as cytoplasmic streamin. ↑ Shepherd, V. A. (2006). "The cytomatrix as a cooperative system of macromolecular and water networks". Current Topics in Developmental Biology. Current Topics in Developmental Biology. 75: 171–223. doi:10.1016/S0070-2153(06)75006-2. ISBN 9780121531751. PMID 16984813. ↑ Hogan, C. Michael (2010). "Calcium" in Encyclopedia of Earth. A. Jorgensen, C. Cleveland (eds.). National Council for Science and the Environment. This page wis last eeditit on 25 Februar 2018, at 04:23.